Guest post by Anna Rose. The Berlin Geekettes did something pretty amazing. Not only did they put on the first all-women Hackathon here in Berlin, but they also demystified the Hackathon format for a number of talented and motivated women and hopefully opened the door for increased female participation in the tech scene here in Berlin. Sweet! On Saturday afternoon, during the pitch presentations, it was very clear that the Geekettes community is absolutely bursting with ideas. About half of the attendees (myself included) lined up to present their hack ideas. I guess we have all wanted to share our hack/product ideas for some time. Finally, here at the Berlin Geekettes Hackathon, we were given a platform where we could present these ideas to a supportive and encouraging community. And so we all just went for it! So many ideas were presented: some were kinda wacky, some were super complicated, some simple and some totally brilliant. My idea was for an app that generated soundtracks for specific book titles (later it was named “BookBeat”). But with so many good hack ideas out there, it must have been hard for Geekettes to choose. I was really lucky to have a few interested participants join my team, and even luckier that my teammates were super talented and had totally complementary skill sets. Once the team was formed, we quickly developed the idea and the user-interface, broke down the tasks and got to it. We only had 24 hours to make this thing! After a few hours of work, it seemed like a good time to try out some of the cool perks the Geekettes had provided us with. I did the stretching session with Melanie in the exercise room and my teammate Josi created a pretty cute little stuffed bird in the Etsy Craft Corner. It was a great way to chill out and give ourselves a little break from staring at the computer screen. I would totally recommend future Hackathon organizers try and implement something like this at their events! The rest of the event was spent hacking, working on the presentations, submitting our hacks, and finally presenting all of our hard work to the community. Amelie prepped us so well for the presentation, encouraging us to test out our set-ups beforehand (great advice for future Hackathons) and as a result things went off with very few technical glitches. After all the presentations (and there were some really great ones), came voting and prize time! BookBeat didn’t win first place, but we did get the Student Prize from Careerloft. Of course we would have loved to have been #1 (don’t forget that this is a competition!) but it was great to see so many teams getting credit for all their hard work. And it was a wonderful way to wrap up an intense, awesome Hackathon. I want to say a big thank you to Denise, Jess, Amélie, Duana, Tiffany, Emily and all the geekettes who worked so hard to put this event together. You provide an open, friendly and fair space for women to explore, learn and flex their tech-muscles. We were all incredibly grateful for the great work you guys did. Oh and btw. the food was really totally amazing! 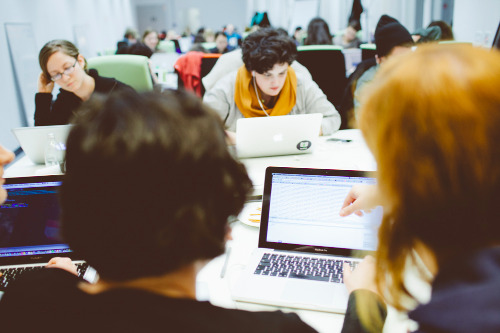 Can’t wait for Berlin Geekettes Hackathon 2.0 ! !